…my question is, how/where do I add it in Blocks? 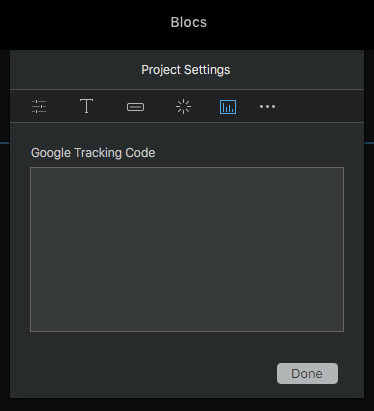 @Ian click the Blocs name in the top middle or go File/Project Settings and click the Analytics Settings and paste your code there. Doh! Thanks, knew I’d seen it somewhere!!! Looks like it will place the tracking code in the head section. According to google it should be place before closing the body. That´s probably why sites don´t appear in the statistics. Thanks @Jakerlund - followed your directions and i can see it now - thanks for your post, google lists various creation tools (like wordpress and says look at their documentation for inserting), i would have just added it to the head if i didn’t check (and of course it wouldn’t have worked because it wasn’t first).